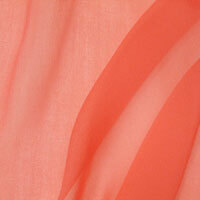 Thai Silks - Fabric » Silk Chiffon » Chiffon, 8mm, 43-44"
Type: 100% Silk. The twisted thread gives this chiffon a matte finish. Light and airy, yet strong. Great for travel, seems not to wrinkle as much as other silks. Hang garments when you unpack. To cut, use sharp scissors; cut through pattern, fabric, and a layer of tissue paper.